The ACRC Provincial Training Recommendations 2018 have now been released. It is with this principle in mind that ACRC, on behalf of partner organizations, endorsed the inaugural series of training recommendations in 2015. The inaugural provincial training recommendation document recently underwent review and subsequent revisions to reflect the changing regulatory landscape and was approved and endorsed by the ACRC Executive Committee on October 3, 2018. The ACRC has developed the following table to guide individuals on the training courses that are recommended and applicable to their work. For links to detailed training/course descriptions, refer to Appendix 1. Refer to your organizational and institutional guidelines for additional training requirements. 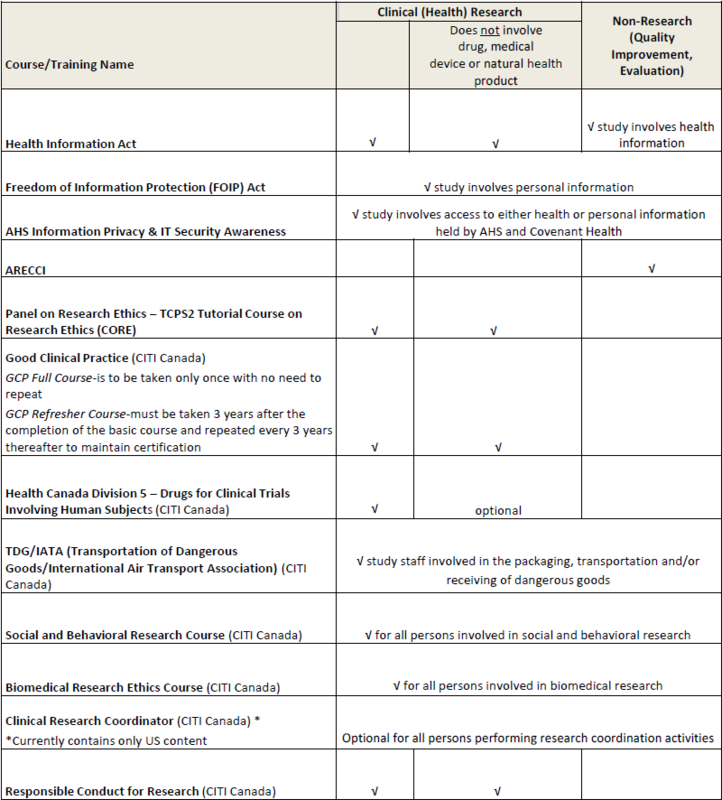 * The Provincial Training Recommendations are subject to change in the event of significant course material content changes or updates; or with changes to either provincial and/or Health Canada regulations and guidelines. Frequency of training is adequately flexible to accommodate different experience levels, and gaps in training of research study staff. Each course may be re-taken at any time if an individual warrants additional training.